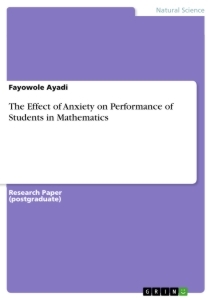 This research work "THE EFFECT OF ANXIETY ON PERFORMANCE OF STUDENTS IN MATHEMATICS" focuses on the relationship between Mathematics anxiety and students performance. 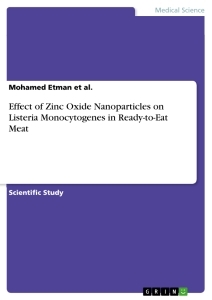 A descriptive experimental research design was used to investigate the research questions. The population consisted of 120 pre-service teachers at Adeniran Ogunsanya College of Education, Ojo Local Government, Lagos State. A personal data questionnaire was used to gather demographic and anxiety information about the participants. The implication of this study of elementary teacher education programs point to increased attention on the Mathematics anxiety of pre-service teachers. This process is two folds. One, it is recommended that pre-service teachers be made aware of their Mathematics anxiety level and two, it is recommended that teacher education programs acknowledge and address the importance of these affective variable and their role in pedagogy. Nigeria envisaged attaining the status of a developed country by the year 2020. By then, the Nigeria society will have evolved into one that is democratic, liberal, tolerant, caring, progressive and possessing a competitive and dynamic economy. It is argued that establishing a scientific and technological culture will lay the foundation towards the attainment of such a society. Hence, Science, Mathematics and technology have always been emphasized in the national development plans. Mathematics certainly means many things to many people (Maritza, 2002). Many aspects of daily life require some knowledge of Mathematics and the ability to use this knowledge is critical to the pursuit of many existing and newly emerging occupational fields. Moreover, all undergraduate students are required to take some level of Mathematics. If students suffer from Mathematics anxiety, their willingness to enroll and succeed in Mathematics courses diminished (Stubblefield, 2006). Mathematics anxiety is a problem for many people. It can have detrimental effects for college students including feeling of nervous tension, fear of rejection, and stress (Truttschel, 2002). Reported consequences of being anxious toward Mathematics include the avoidance of Mathematics and the decline in Mathematics achievement. This kind of "anxiety" is first detected in the late 1950s. Dredger and Aiken (1957), noticed undergraduate college student reacting emotionally to arithmetic and Mathematics. Although the reaction is appeared to be similar to test anxiety in general, they found that Mathematics anxiety is a potential factor prose. They have labeled it "number anxiety", which is often assumed to be a high level of anxiety impairs performance. Many adult are blocked from professional and technical job opportunities because they fear or perform poorly in Mathematics. Most of these adults are brain capable of learning more Mathematics; it is not a failure of intellect, but of nerve. All people have some Mathematics anxiety, but it disables women and minorities more than others. There is a cure, but it involves changing learners and teachers attitudes at the same time. Mathematics educators need to recognize the causes of Mathematics anxiety. Educators can become more informed about the effects of Mathematics anxiety by reading related literature and attending workshops and conferences on the topic. Pre-service teachers should be made to realize that myths such as Mathematics aptitude are genetic and Mathematics being a male domain is simply not true (Woodard, 2004). Changing attitudes about Mathematics will require support from parents, teachers and society. If negative attitudes are not changed, students' performance, college and career choices will be limited (Shields, 2006). Mathematics anxiety is a reality for many students. Educators should be knowledgeable about its causes and provide supportive learning communities that assist students in overcoming it (Barnes, 2006). In a country such as Nigeria, many jobs demand sophisticated knowledge of Mathematics, in depth knowledge of mathematics is needed to obtain a desired position in the work force. In addition to its necessity in scientific and technological field, knowledge of mathematics is increasingly important in business, social sciences and humanities. Jacob (2004) opined that mathematics provide students with a uniquely potent set of tools to understand and change the world, these tools include problem solving skills, logical reasoning, and the ability to think critically. Mathematics is important in everyday life in many form of employment, in the medical field, the economy, the environment, in science and technology, and in public decision making. 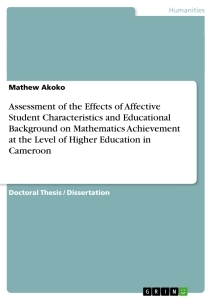 The result of this research work is to ensure that pre-service teachers learn to develop their potential and confidence in mathematics. - Is there any significant effect of anxiety on students' performance in mathematics? - What effect does pre-service teachers' gender have on mathematics anxiety? - Will there be any significant impact of mathematics anxiety on students' interest to study mathematics? - Will there be any relationship between mathematics anxiety and students perception of the value that society places on mathematics? Green and Allerton (1999), described mathematics anxiety as the state of mind developed through personal experience, and individual emotional response to these experiences. They further explained that, negative feelings towards learning of Mathematics arise as a consequence of a range of encounters relating to the way mathematics is presented, taught and learnt by individuals. Sheffield and Hunt (2007) opined that, mathematics anxiety is the feeling of anxiety that some individuals experience when facing mathematical problems. They further assert that, like other form of anxiety, students may feel their heart beat more quickly or strongly, they may believe that they are not capable of completing mathematical problems, and avoid attempting mathematic courses. - Develop Strong Skills And A Positive Attitude Toward Math. - Relate Math To Real Life. - Accommodate Students’ Varied Learning Styles. - Place less Emphasis on Correct Answers and Computational Speed. - Organize Students Into Cooperative Learning Groups. The participants of this study comprise 120 pre-service teachers, selected randomly from 6 different combinations in department of mathematics. Chi Square: The data collected for the study were analyzed by using chi-square for the first twenty questions, the values attached to the responses of the questionnaire were based on the statistical means of SA- Strongly Agree, A- Agree, D-Disagree and SD-Strongly Disagree. Mathematics Anxiety Rating Scale (MAR-S): This questionnaire was developed by the researcher and contained 10 items of situations which can cause math anxiety. Each item of this scale was rated on a four point Likert scale rating, from strongly agree-4 to not strongly disagree-1 and ratings were reversed for anxiety absent items. There will be no significant relationship between mathematics anxiety and students' perceptions of the value that society places on mathematics. Table 4: Score associated with mathematics anxiety and students' perceptions of the value that society places on mathematics. Students perceived level of mathematics anxiety was measured based on their responses to the items raised in the questionnaire in section B. 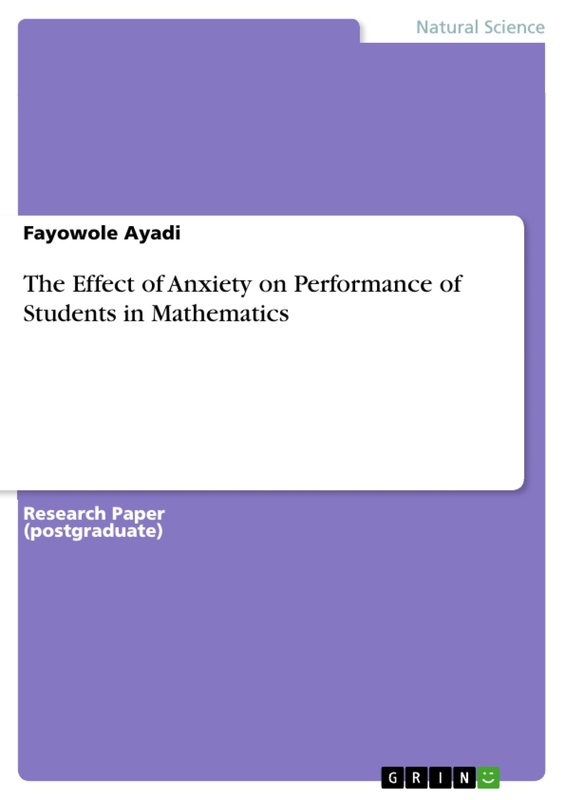 The study was carried out to investigate and analyze the effect of mathematic anxiety on performance of students in mathematics. 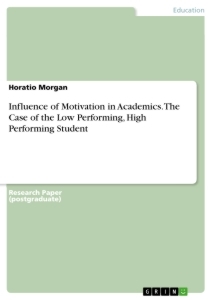 The result of the study revealed the finding of the analyzed data, the four null hypothesis formulated and tested were all rejected as the result revealed that the first hypothesis which the respondent agreed that students performance in mathematics greatly depend on their level of mathematics anxiety which was in support of what Cavanaugh (2002), explained that researchers and educators alike have dug further into the topic "mathematics anxiety" or the avenue in which students lack confidence in the subject "mathematics" which erode their academic performances and achievement in it.. The second hypothesis revealed that the respondents agreed that there is a relationship between gender difference and mathematics anxiety among pre-service teachers which was in support of what Firuju (2005), pointed out that, regardless of the anxiety level, the male perform better than the female in test which measure numerical, mechanical and spatial abilities. The third hypothesis that the respondent agreed that mathematical anxiety will greatly impact students interest to study mathematics which was in support of what Yerilmez, Girgniner and Uzun (2007), explained that mathematics anxiety can occur in all levels of education from primary school to higher education, and once established, can persist in life, interfering with everyday activities involving numeracy and further learning of mathematics. The forth hypothesis result shows that there is a relationship between mathematics anxiety and students' perceptions of the value that society places on mathematics which was in support of what Baylor, Shen, Wawen (2000), discussed that students tend to have high level of nervousness, fear or discomfort towards mathematics, due to their prior experiences with mathematics teachers and other influential persons. Mathematics anxiety scores, as measured on the MAR-S had a positive significant relationship with the students' perceived level of mathematics anxiety. This result was in agreement with the conclusions reported by Shields (2006) that indicated a strong positive correlation between students' perceived level of mathematics anxiety and mathematics anxiety score, as calculated on the MAR-S. This data reveals that simply asking the students to rank their anxiety level was comparable to administering the MAR-S which is the most widely used mathematics anxiety instruments. The results of the study, generally, indicated that most of the pre-service teachers did not exhibit high level of anxiety. Student prior experiences with mathematics teachers and other influential persons have been identified as the greatest influence on the development of mathematics anxiety. In concise term, this study showed the relationship between students' perception about society mathematics myths and mathematics anxiety. It is worth mentioning that further research should be conducted on mathematics anxiety in relation to job prospects. - Mathematics educators need to recognize the causes of mathematics anxiety. Educators can become more informed about the effects of mathematics anxiety by reading related literature and attending workshops and conferences on the topic. - Students should be able to realize that interest to learn mathematics greatly influence their performance in mathematics. - Mathematics anxiety is a reality for many students; educators should be knowledgeable about its causes and provide supportive learning communities that assist students in overcoming it. Dredger R. M. & Aiken L. R. (1957). The identification of number anxiety in a college population; J Educational Psychology. 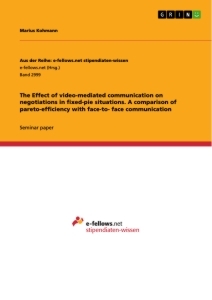 47: 344-351. Shields, D. J. (2006). Causes of math anxiety. The students' perspective. Unpublished doctoral dissertation, Indiana University of Pennsylvania, Indiana.